The Fiji Pine Group of Companies’ bonus payout to pine landowners last week of a record $7 million was a far cry from the doom predicted by opposition parties and critics around 2010 with debt being the major problem. It seemed as if the pine industry would bury itself among the thousands of pine trees in the forests around the country. The Government quickly saw this decline and knew they had to get the ship in the right direction and appointed a new captain, Faiz Khan to steer it clear of the stormy waters. This was no easy task during those days because commercial banks steered clear of the FPGC and did not want to get into the mix fearing this was a losing battle – in fact the financial status then pointed to this. It was understandable, but then again who would want to bail out a sinking ship. The Prime Minister, realising the precarious state the company was in and above all, the number of families who depended on the industry, stepped in and used his wisdom. Arranging loans with the Fiji Development Bank, Reserve Bank of Fiji and Fijian Holdings Limited, the PM patched up the leakages through good management from Mr Khan and his team which saw the boat maneuver its way through the storm. 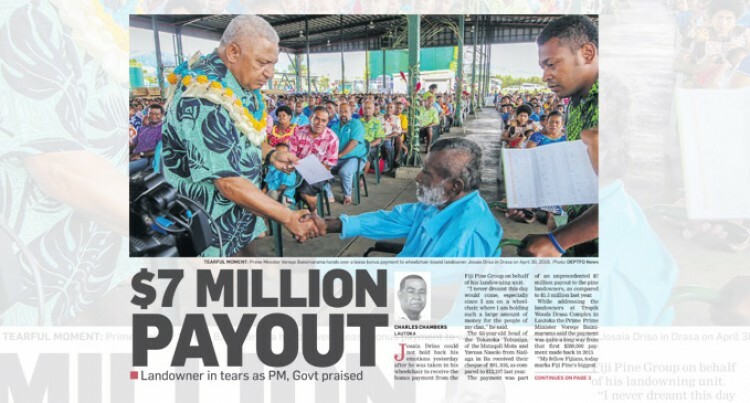 Mr Bainimarama took the risk and it paid off – he wanted the landowners to get something back for the valuable use of their land. He wanted the employees of FPGC to keep their jobs as they too had families. In reality, he took the risk for the ordinary people and for bread and butter issues. This was realised by the head of a landowning unit from Nailaga as he shed tears after receiving more than $91,000 as compared to $12,000 last year. The highest payout went to a landowning unit from Vitogo in Lautoka with more thaner $350,000 as compared to $40,000 last year. In 2013 landowners received a bonus payout of $350,000 and things were looking up. The landowners at Drasa last week could not believe their ears. Government taking control and appointing the right people into key positions – that was the key. The group also announced the completion of debt payments to Westpac where more than $4 million was paid out to make the company debt free. This turnaround has been massive as the payout proves. Landowners now realised that they too had a pot of gold at the end of the rainbow. Now there is no looking back. FPGC has installed new state of the art equipment at Drasa. The signs are looking good for the pine industry and is a lesson to those who continue to preach doom in Fiji.